All of PASS’ UST operator training courses meet and exceed the federal requirements for UST operator training and are offered through our in-house designed and built Learning Management System (LMS). PASS’ state-specific A/B training courses are custom tailored to meet state requirements, and are accepted by more states than any other training provider. Our courses are available on demand, 24/7 and are accessible from any internet-connected computer, tablet, or phone. The student can complete an entire course in a single session or take the course in segments. The training may be stopped and restarted, allowing for maximum schedule flexibility. PASS also does not impose time restrictions on course access, so students may take as much time as they need to complete their training. PASS’ UST operator training course content is divided into chapters. Each chapter utilizes a combination of text, images, and narration, providing a multi-faceted learning experience for diverse learning styles. Each chapter is followed by a quiz. If the student answers a quiz question incorrectly, the application automatically redirects the student to the correct course information. The student is then given another opportunity to answer the quiz question. This reflexive quizzing model ensures comprehension of the course material and reinforces learner retention. The PASS UST Class C training course consists of seven primary chapters, which are summarized here. Each chapter is followed by a short quiz. Once a student has completed all chapters and quizzes (approximately 30 minutes), he or she will be directed to print out an Orientation Checklist. During the student’s orientation tour of the facility, the student and the manager or Class B Operator will check off each item on the list as it is identified and explained. When the Orientation Checklist has been completed, the student may print his or her UST Class C operator certificate. This orientation is to be performed by a manager or Class A/B operator at the Class C operator's facility. 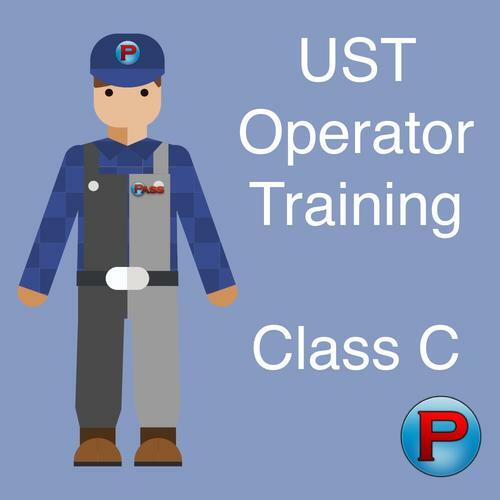 It will familiarize the trainee with the various site-specific components of the facility and relate them to the content discussed in the PASS UST Class C Operator Training Course.